I am doubling my recipe to freeze, so I’m using two boxes of pasta, two jars of pasta sauce, two cans of diced tomatoes and four chicken breasts. You can even triple the ingredients to make a larger freezer batch too. Pre-heat the oven to 375 degrees. Season the chicken with salt and pepper and bake for about 30 minutes or until chicken is cooked through. Remove from the oven, let cool and then dice. Set aside. 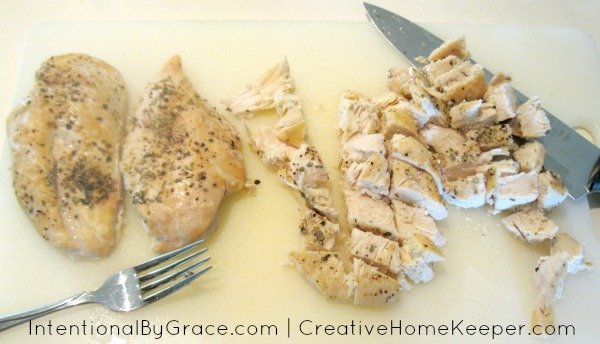 Freezer tip: I always like to keep cooked, sliced or shredded chicken in the freezer for quick easy meals. While chicken is cooking, boil the pasta in salted water in a large stock pot – leaving the pasta slightly firm (al dente) because the pasta will continue to bake in the oven once you mix together with remaining ingredients. Drain and place pasta back in the stock pot. Clean Eating Tip: If you are gluten-free you can always substitute with a gluten-free pasta or with spaghetti squash (my personal favorite). Combine cooked chicken and pasta together and stir to combine. 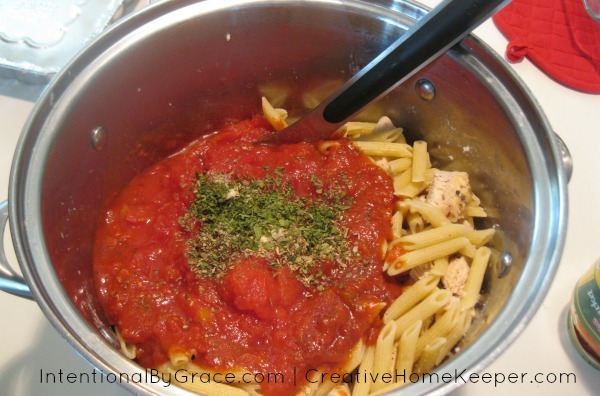 To keep clean up easy, I use the same stock pot that I cooked the pasta in. Once chicken is mixed in add tomato sauce, dice tomatoes and spices. Stir to incorporate. Clean Eating Tip: Store bought pasta sauce is often loaded with a lot of unnecessary ingredients, including a lot of sugar. I always read the ingredient list and have found an organic variety that my store carries that I’m OK with purchasing. 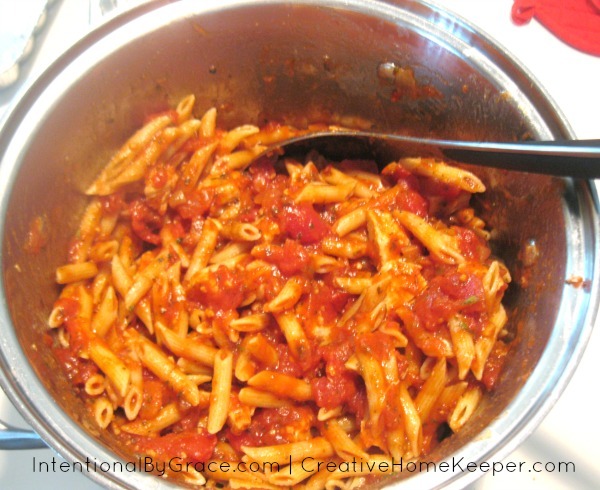 You can always make your own pasta sauce with crushed tomatoes, garlic and the spices straight from your pantry. Spray or butter foil pans. As you can see from the picture I’m using 3 square foil pans and 1 square glass baking dish. I made one for dinner and froze the other three. The square dish feeds both my husband and I, plus our two toddlers with 1 serving of leftovers. 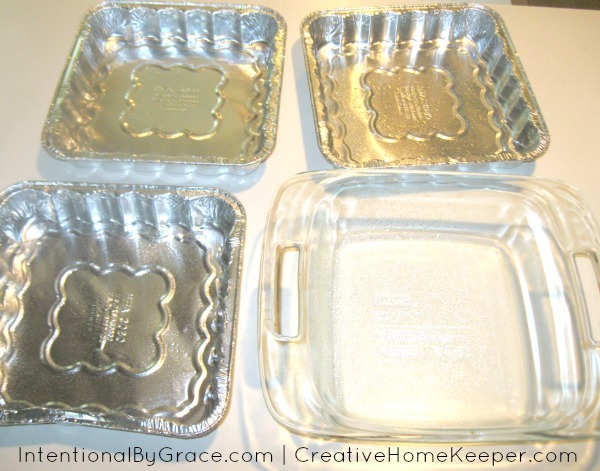 Depending on the size of your family, you will want to choose the right size baking dish. Evenly distribute the pasta into all pans. Sprinkle the top with mozzarella cheese. Spray or butter the top of a piece of foil (to keep the cheese from sticking to the top) and place the foil on top of each pan. Clean Eating Tip: You can easily omit the cheese if your family is dairy free. It tastes just as good without! 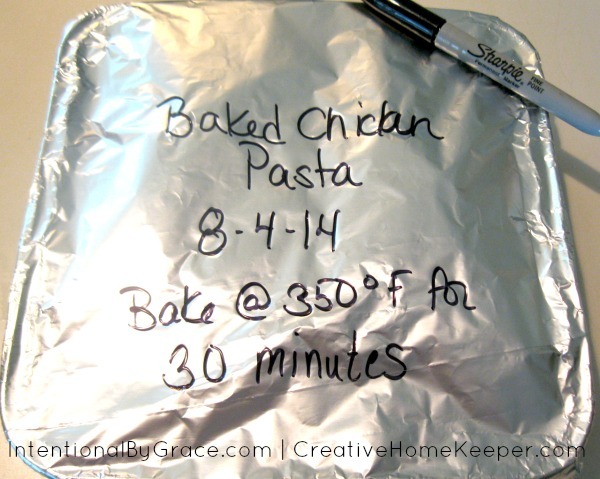 If freezing, write the name of the dish on the foil along with the date and cooking directions. Place in a gallon sized zip-lock bag and store in the freezer. If cooking right away, place in a 350 degree oven for 30 minutes or until warmed throughout and the cheese is melted on top. 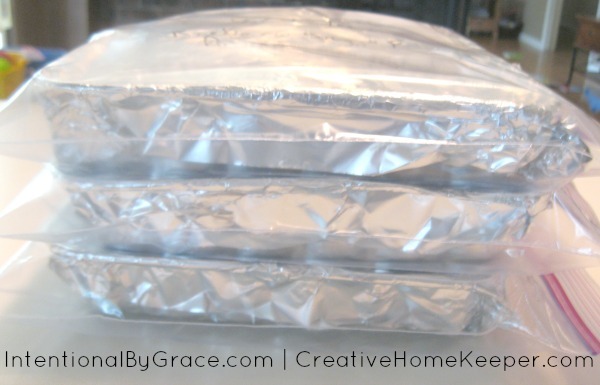 Freezer Tip: I like to write the cooking directions on the foil so that way I can re-use the zip-lock bags again, which saves money. You can cook frozen, just add about 20 minutes onto the cooking time, or you can place the frozen pasta pan in the refrigerator to thaw and cook as above. Serve this pasta dish with a fresh green salad or some steamed or roasted veggies for a complete balanced meal. While chicken is cooking, boil the pasta in salted water in a large stock pot – leaving the pasta slightly firm (al dente) because the pasta will continue to bake in oven once you mix together with remaining ingredients. Drain and place pasta back in the stock pot. Combine cooked chicken and pasta together and stir to combine. 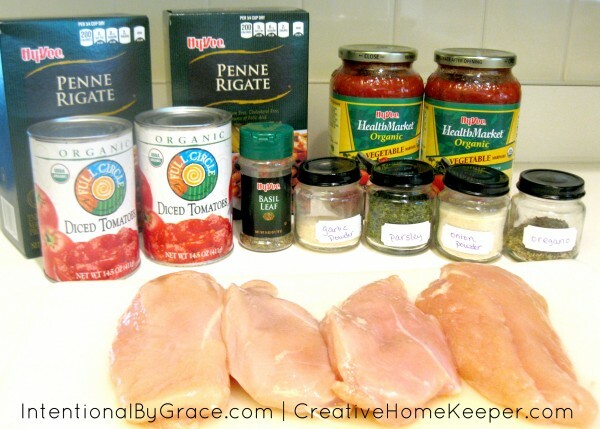 Once chicken is mixed in add tomato sauce, dice tomatoes and spices. Stir to incorporate. Spray or butter foil pans. Evenly distribute the pasta into all pans. Sprinkle the top with mozzarella cheese, optional. Spray or butter the top of a piece of foil (to keep the cheese from sticking to the top) and place the foil on top of each pan. If freezing write the name, date and cooking directions on the foil and place in a gallon sized zip-lock bag and store in the freezer. If cooking right away, place in a 350 degree oven for 30 minutes or until warmed throughout and the cheese is melted on top. Easy Oven Chicken Fajitas Starter Bags- prepare the chicken, peppers, onions and spices then combine together in a freezer zip-lock baggie. When you’re ready to cook, defrost bag in the refrigerator and place in a baking dish. Southwestern Burgers– Combine spices with the ground turkey and form into patties. Wrap each patty in wax paper and place in a freezer bag. Pull out desired number of patties to thaw in the refrigerator and cook on the stove top or grill. Ultimate Harvest Chili Starter Bags- Cook the ground beef, pepper, onions and spices on the stove top. Let cool before placing in a freezer bag. You can also add the beans if you wish, or just add them at cook time. When ready to cook, place the bagged ingredients in a crock pot or stock pot and cook. I actually just throw in the contents frozen since the best chili cooks and simmers for several hours. Mexican Chicken Chili– Combine all the ingredients into a freezer bag. When ready to cook, throw the bagged ingredients into the crock pot and cook. In a few months I’ll be busy stockpiling my freezer with even more meals as I prepare for baby number three. What are some of your favorite meals that you like to cook and freeze for easy dinner prep? 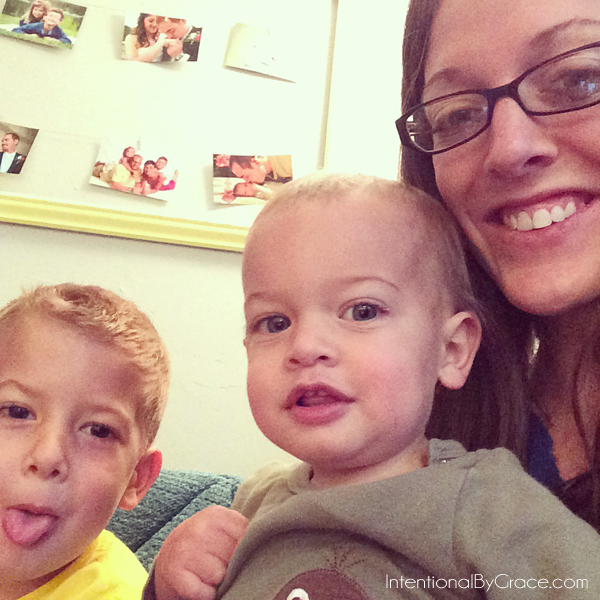 Victoria Osborn has been married to her best friend for eight years and is a mother to three young children, all under the age of 4, who keep her on her toes most days! She loves Jesus, writing, coffee and all things book related. 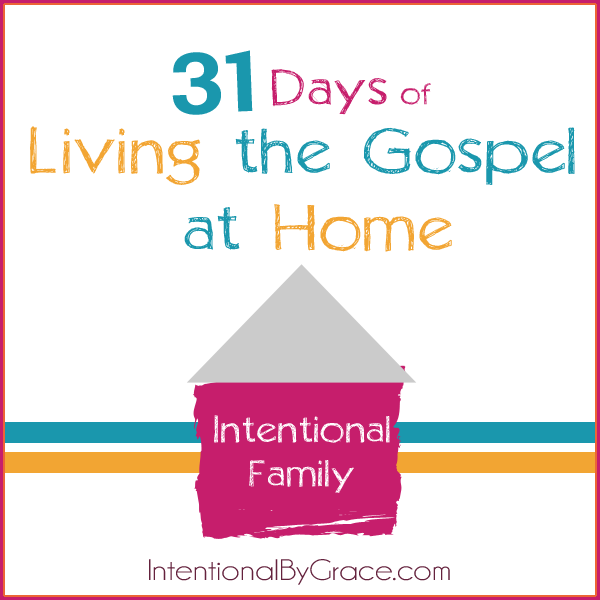 You can find her writing at Creative Home Keeper where she desires to share tips and encouragement for living simply, intentional and inspired. This looks absolutely delicious, Victoria! I think I’m going to be putting this on next month’s meal plan! I hope you enjoy it Jane! It’s so easy to make and it is pretty good too! 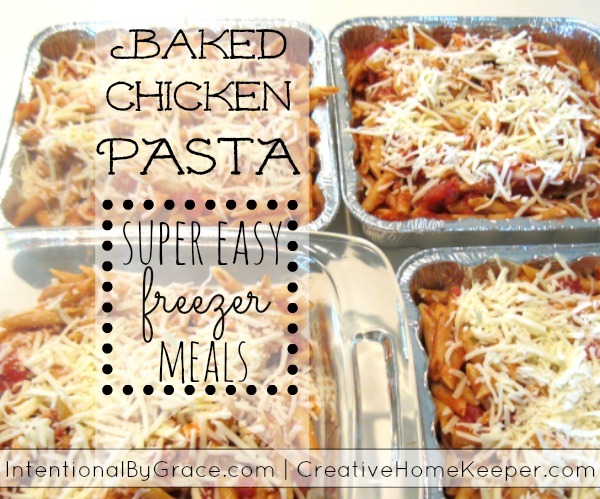 I love freezer meals – pinning this one! I’m printing this now. Sounds delicious and easy – my favorite things in a recipe!